CNC TECH TALK MMS MAY 2018 34 mmsonline.com Processes and Programming Helping Machine Operators with Math MIKE LYNCH | COLUMNIST Requiring machine operators to perform calculations repeatedly has a negative impact on productivity. 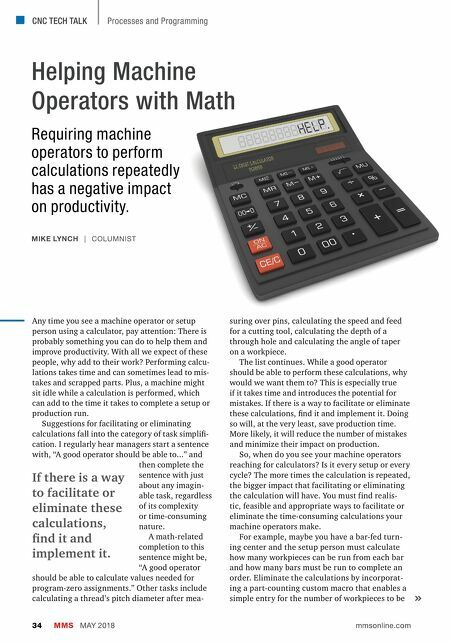 Any time you see a machine operator or setup person using a calculator, pay attention: There is probably something you can do to help them and improve productivity. With all we expect of these people, why add to their work? Performing calcu- lations takes time and can sometimes lead to mis- takes and scrapped parts. Plus, a machine might sit idle while a calculation is performed, which can add to the time it takes to complete a setup or production run. Suggestions for facilitating or eliminating calculations fall into the category of task simplifi- cation. I regularly hear managers start a sentence with, "A good operator should be able to..." and then complete the sentence with just about any imagin- able task, regardless of its complexity or time-consuming nature. A math-related completion to this sentence might be, "A good operator should be able to calculate values needed for program-zero assignments." Other tasks include calculating a thread's pitch diameter after mea- suring over pins, calculating the speed and feed for a cutting tool, calculating the depth of a through hole and calculating the angle of taper on a workpiece. The list continues. While a good operator should be able to perform these calculations, why would we want them to? This is especially true if it takes time and introduces the potential for mistakes. If there is a way to facilitate or eliminate these calculations, find it and implement it. Doing so will, at the very least, save production time. More likely, it will reduce the number of mistakes and minimize their impact on production. So, when do you see your machine operators reaching for calculators? Is it every setup or every cycle? The more times the calculation is repeated, the bigger impact that facilitating or eliminating the calculation will have. 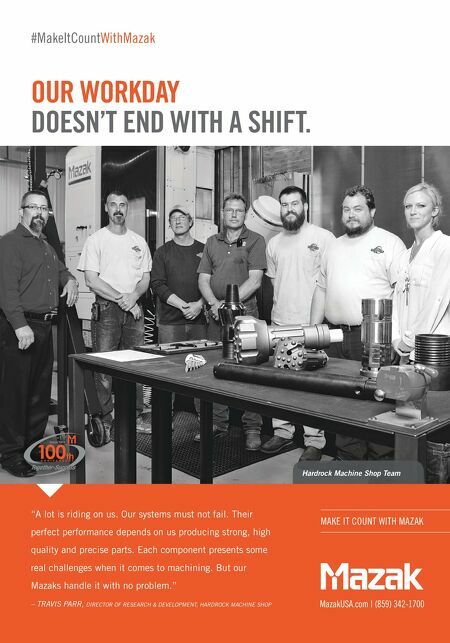 You must find realis- tic, feasible and appropriate ways to facilitate or eliminate the time-consuming calculations your machine operators make. For example, maybe you have a bar-fed turn- ing center and the setup person must calculate how many workpieces can be run from each bar and how many bars must be run to complete an order. Eliminate the calculations by incorporat- ing a part-counting custom macro that enables a simple entry for the number of workpieces to be If there is a way to facilitate or eliminate these calculations, find it and implement it.